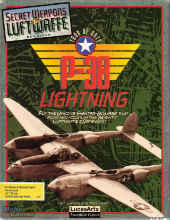 P-38 Lightning is an add-on for Secret Weapons of the Luftwaffe, adding this tough plane to the action. There are new missions featuring it, such as escorting or assisting bombing raids, and the chance to use it in missions you create in the Mission Builder. The manual featured historical details about and photographs of the plane.